A Folding Doors system brings the outside in and the inside out creating that indoor outdoor feeling . With many different configurations , panel options , and hardware options we have to offer these door systems are ideal for any exterior door replacement , remodel upgrade and even interior room separations. If you love fresh air, enjoy indoor out door living, you are looking to add value to your home or simply just wanting that wow factor then a Bi-Folding door system is what you need. Our unique blend of strong rigid aluminum framing with a long-lasting, low maintenance vinyl capping creates a unique combination not available from other manufacturers. And one which is also thermally improved. Fold walls open with AG Millworks Bi-fold Doors and change your view of the world. Narrow site lines are available for maximum light, and if you want to go super-big, we make bi-folds with individual door panels as large as 4 feet wide and 13 feet tall. 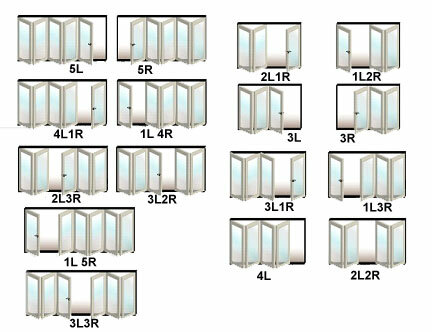 Made in the USA, our doors are energy-efficient and fully customizable with flat panels, divided lites and lock rails. Exquisite wood surfaces on the interior provide warm, luxurious design details. Thick extruded aluminum exteriors with durable baked-on Kynar paint in any imaginable color completes the picture. Bi-Fold Doors are also available with wood exteriors (limited warranty). Expand your world view with AG Millworks Bi-Fold Doors.